We men are pretty simple creatures. We like simple things like blackjack. But why? Why do men flock to blackjack tables in droves, abandoning the bright lights and loud noises of the pokies? Anyone who has lived with a man could be forgiven for thinking men would be naturally attracted to the pokies. We all know men’s attention span is limited and can be easily interrupted by flashing lights and bright objects. We will look at the top five reasons men prefer Blackjack over the pokies. It might be hard to believe but there is less thought required in blackjack. The vast majority of hands require one of two decisions: stay or hit. Simple. Sure you can delve into the complexities of doubling down or splitting pairs, but in essence you either hit or stay. On top of that you never have to count past 21. Anything beyond 21 isn’t a number, it’s too many, it’s a loss! Think back, every man you know can count to at least 21. Pokies are a completely different beast altogether. You have to decide which game to play, then you have to decide on how many lines you want to play, how many coins/credits do you want to bet per line, how do you trigger the feature? Ok, five of those symbols pays 150 coins, but I’m betting five coins per line: how much did I just win? Too many variables and possibilities leave men confused and afraid. This is why we prefer blackjack over the pokies. If you ever take a stroll around the main floor of a bricks and mortar casino you will notice that the Blackjack tables with a good looking girl as a dealer will always be full to the rafters. This is because men, generally, like to impress good looking women. We seem to think if we can manage to win a fortune at the blackjack table the good looking lady dealer will tear off her clothes and dive over the table at us. But when you are playing the pokies you are usually surrounded by retirees pumping their pension checks into the pokies. Hard to feel as though you’re impressing the lady next to you when her false teeth keep falling out. Show-boating is part of the male genetic makeup. We like people to know and see how well we are doing and how good we are. This is an easy thing to achieve at a Blackjack table. With piles of chips stacked in front of you everyone who walks by can easily see how much money you have won. By yahooing and hamming it up a little you can attract more attention to yourself without seeming like too much of a drop-kick too. When you’re playing the pokies the only way to attract attention to how good you are doing is if alarm bells and flashing lights go haywire because you have won a massive jackpot. Outside of that you would have to tap people on the shoulder and point out your winnings, on the screen. Doing that, however, would make you a knob. And there is nothing more cringe-worthy than seeing a grown man woop it up and carry on after a pokies win. It’s just sad for some reason. As a rule of thumb men want to win. So it should come as no real surprise we can actually be quite knowledgeable when it comes to the house edge and Return to Player of games. Generally the house edge on bricks and mortar casino games around Australia is 0.59%. This can fluctuate depending on different rule changes, but generally, 0.59% is the stat. The house edge on pokies can range anywhere from 2% to a whopping 15%. 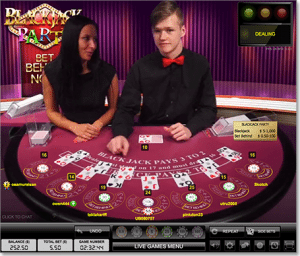 The Return to Player percentage can obviously vary greatly from game to game and from each gaming production company but you can get an online blackjack game with an RTP of up to 99.72%. On the other hand the RTP for online slots can swing greatly from roughly 93% up to 97%. On an average blackjack table at a bricks and mortar casino, a dealer, dealing to a full table of seven boxes can complete around 56 hands per hour. Betting $25 per hand is a conceivable loss of $1400 per hour. In stark contrast a poker machine can spin up to 28 times per minute that’s a possible 1680 spins per hour! Playing max bet of $5 per spin is a conceivable loss of $8400 per hour. Not exactly rocket science is it…. ?